Listening. Sharing. Supporting. Mentoring. Learning. Appreciating. Understanding. Each of these words can be defined through the prism of action. At the University of San Diego, these actions make an impact, and make a real difference. Building community is at the core of what started as the Office of Volunteer Services, became the Center for Community Service-Learning, and is now the Karen and Tom Mulvaney Center for Community, Awareness and Social Action. It was 1952, the same year that the first-ever classes took place on the San Diego College for Women campus. A young woman named Judith was living on a small family farm in Council Bluffs, Iowa. It was there that she began the journey that would ultimately lead her to USD. Her desire to help others began by volunteering with the Red Cross during the 1952 great flood of the Missouri River. Years later, the first-generation college graduate of the University of Iowa moved to San Diego with her husband, Dr. Thomas Rauner. They raised four children; dedication to family was equaled only by a desire to help others through community service. Judith Rauner wrote a handbook for nonprofit organizations, Helping People Volunteer, in 1980. A few years later, she co-authored Gaining Momentum for Board Action, a book aimed at nonprofit boards of directors. She worked for the United Way and created the Young Volunteers in Action program for the San Diego Unified School District. it until her 2002 retirement. 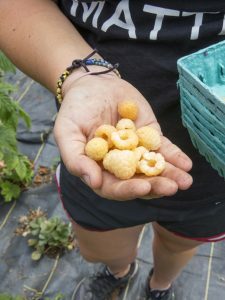 The center changed the campus culture through its community service-learning programs, which encouraged students to volunteer for specific needs by matching their skills and interests with those of partner community organizations. “Judy was an incredible mentor and an inspiration to students, faculty and all of us on staff,” recalls Elaine Elliott, who began working with Rauner in 1995, ultimately becoming her successor as director of the center from 2002 to 2010. Rauner died in 2009 at age 71; her legacy and the importance of interacting and working alongside community lives on through new center staff. “The same way we treat our family, that’s the way we have to be in our community,” reflects Mulvaney Center assistant director Austin Galy ’17. Going outside one’s comfort zone is a frequent refrain in conversations about experiential learning. Through the Mulvaney Center and many other USD centers, institutes and programs, opportunities both local and far flung are plentiful. 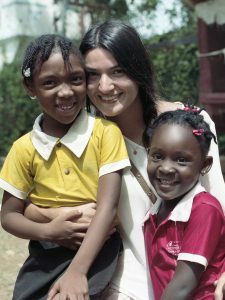 Maria Silva ‘12 on an immersion trip to Jamaica. She is now the Mulvaney Center’s director of neighborhood and community engaged partnerships. San Diego County offers many opportunities for students to gain true understanding with, for example, international and refugee populations. Linda Vista’s Bayside Community Center, the Southern Sudanese Community Center, Somali Family Services and many more partner with the center. Students, staff, alumni and administrators have also visited New Orleans to learn from and to work within its communities. The Mulvaney Center is one of a few USD groups that conduct immersion visits to Tijuana. Other options include excursions to Nogales on the Arizona/Mexico border and trips with a community building component to Duncans, Jamaica, Makuleke, South Africa, China and Guatemala. John Loggins ’95 (BA), ’12 (MEd), the Mulvaney Center’s director of community engaged learning, did a Peace Corps mission in Jamaica following graduation. Years later, he joined forces with a former USD professor, Rafik Mohamed, to create a Jamaica immersion trip/class. The center’s tradition and mindset hasn’t wavered from Rauner to Elliott to Nayve, who’s been at the helm since 2010. “At its core, community engagement is about relationships. If Judy Rauner or (former USD Provost) Sister Sally Furay or the university’s founders — all of whom helped create the work we’re doing today — were still here, they would see their work in action,” Nayve says. And when Tom Mulvaney, a USD law alumnus, and his wife, Karen, announced their generous gift to the center, it wasn’t as much about money as it was about their belief that Nayve, Loggins and the center’s team and students are doing it the right way. “It’s about taking the concept of community and helping students, faculty and alumni understand that this is a worldwide community,” said Tom Mulvaney ’77 (JD), now a member of USD’s Board of Trustees. 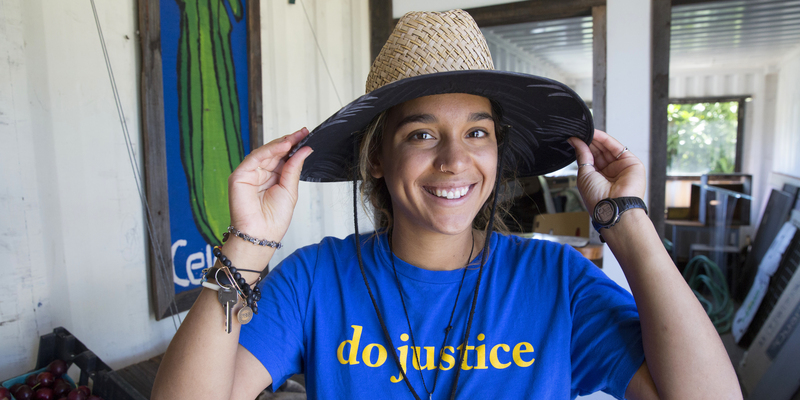 Making the world a better place is why Tom and Karen created the Mulvaney Immersion Communities for Action and Humility (MICAH) Summer Fellowship, a partnership that’s connected USD and Saint Mary’s College students for an eight-week program since 2015. Participants from USD have the option to create positive social change in Northern California or Tijuana. Alameda Point Collaborative in the San Francisco Bay Area. Madison Ryan ‘18 and Sam Eller ’17 were finishing their sophomore year at USD when they became part of the inaugural summer cohort. “It’s important to do something meaningful. When I heard John Loggins was sponsoring it, I knew it had to be great,” Eller recalls. Ryan knew she was venturing outside of her comfort zone to do the fellowship, but she was still surprised by the end result. Ryan worked at Oakland’s Prescott Joseph Community Engagement Center, helping to develop a family resource center and participating in an art therapy program/healing arts center. It’s clear that the Mulvaney Center is a vital and vibrant presence on campus, given that it connects to the majority of the university’s student population. Every year, community engagement is a component of more than 150 USD classes, connecting with more than 130 community partners. 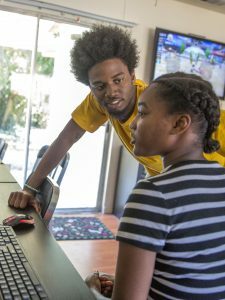 Jawara “Duce” Mills ‘18 has worked with the Mulvaney Center throughout his time at USD. He’s also involved with Associated Students and the BSRC. One person who’s plumbed that depth firsthand is Judith Liu, PhD, a USD sociology professor since 1982 and Mulvaney Center faculty liaison in 2001-2002 and again since 2005. “Education is a really the quest for meaning. Students who come into classes that have community engagement projects really come to see the importance of meaning and action,” she says. Liu has been a community champion and advocate, mentor, coach and facilitator to students and faculty. One example of a strong community friendship and relationship is the one she shares with Montgomery Middle STEAM Magnet School resource teacher Emalyn Leppard ‘98. “When I think about community partnerships, I think about Montgomery and USD,” Loggins says.